A year and a half ago, then 11-year old Lynzi Milano was all about sports. She was (and still is) a devoted Golden State Warriors fan. She was a basketball player herself. She played tackle football with the boys. Her life revolved around a heavy schedule of practices and games, and she liked it that way. Given her activity level, it would be easy to understand if she got pretty tired at times, or if she drank more water than most kids her age do. But Emily, as well as Lynzi’s dad, Dave Milano, began noticing an excess of both. Lynzi spends time with each of her parents, and they keep in close contact about her. 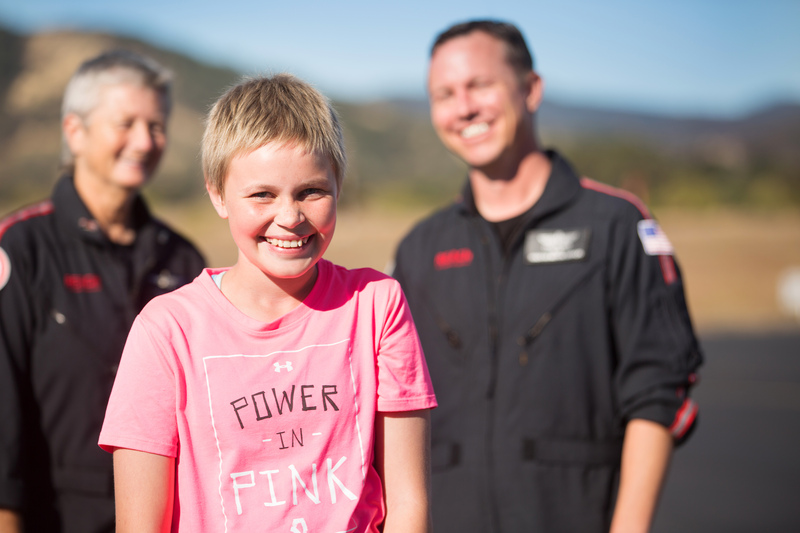 A year and a half ago, this beautiful, athletic girl didn’t know she was about to go through an extremely challenging time, or that in a few months she would take a helicopter ride that might have saved her life. Lynzi did have diabetes, just not the type Emily was thinking of and the type most of us are familiar with, diabetes mellitus. Lynzi was diagnosed with diabetes insipidus (DI), which is very rare. Although they have similar names, these two conditions are entirely separate and have very different mechanisms. In keeping with Lynzi’s symptoms, DI is characterized by excessive thirst and urination. This occurs because the body can no longer regulate its fluids. Typically, DI occurs after pituitary gland surgery or after a major head trauma that impacted the pituitary gland. Lynzi’s MRI, however, showed nothing unusual. 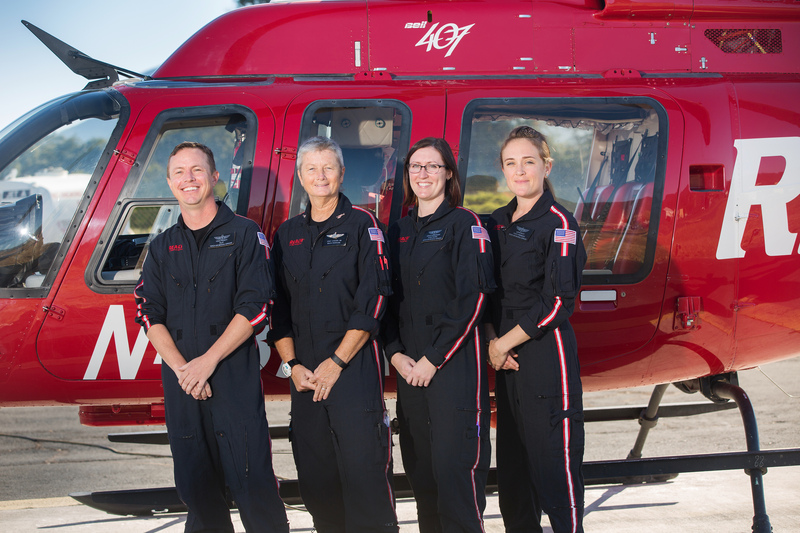 L to R Pilot Craig Piowaty, Flight Nurse Cindy Scruggs, Flight Nurse Ashley Giangrosso, Flight Paramedic Laryn Hoytt. Lynzi and her family conferred with doctors the day before Thanksgiving. She underwent spinal taps and an array of tests to determine what the abnormal findings of the MRI were and if the suspected cancer was anywhere else in her body. It wasn’t. With an exception of no longer producing ADH and an abnormal MRI, all other tests were normal. Lynzi needed a biopsy to determine the cause of the abnormal areas and to obtain an official diagnosis. “Lynzi got the top guy at Stanford, Dr. Michael Edwards for the biopsy,” Emily says. For the procedure, Lynzi was put in a halo, and the doctor accessed her brain through her nose. Lynzi was finally diagnosed with a Pure Germinoma, a type of germ cell tumor. Germinomas are rare, representing just 3-5 percent of all childhood brain tumors. Germinomas can be benign or malignant; they occur twice as often in males and are usually diagnosed between ages of 10 and 21. (Lynzi was now 12.) Germinomas are treated with chemotherapy and radiation. Lynzi would need four rounds of chemo to try to stop the tumor from growing and six weeks of radiation to hopefully kill it. Everyone was thrilled when after two rounds of chemo; there was no sign of the Germinoma. Nonetheless, doctors wanted Lynzi to complete the originally prescribed cycle of treatment. Lynzi had a lot of support along the way, especially from her family. She had her mom and dad, her mom’s boyfriend Wayne Scheidemann, her stepmom Jessie Milano, and her siblings—Aleia (15), Jaela (8) and Tyrus (17 months). Also keeping watch were the family pets: the dogs, Josie, Sam and Minnie, parrot Jackson, and her beloved all-black cat, Bella. And many friends from school were there along the way. By mid-April, Lynzi felt better than she had in quite a while. One weekend, she even felt good enough to go swimming on Saturday and shopping with her dad and sister on Sunday. Partway through their excursion, however, Lynzi said she wasn’t feeling very well. They cut their excursion short so she could go home and rest. Lynzi was up frequently that night, urinating and rehydrating, urinating and rehydrating. By morning, Lynzi was vomiting. She had an 11 a.m. appointment at the hospital to get her routine labs done. “When I met her at the hospital, she felt warm,” Emily says. “I took her temperature. It was 101.3.” On the advice of Lynzi’s oncologist, Emily took her to the ER, where it was confirmed that Lynzi was neutropenic. Neutropenia occurs in about half of people with cancer who are undergoing chemotherapy when the level of neutrophils—a type of white blood cell—drops too low. Like all white blood cells, neutrophils help the body fight infection. Their specialty is destroying bacteria in the blood. As long as Lynzi remained neutropenic, her susceptibility to bacterial infections would be much higher. When not taken care of quickly, bacterial infections can become life threatening in a very short time. In less than an hour, Lynzi’s temperature was up to 103.2. It was time to get her to Stanford. A ground ambulance could be there in about three hours, and initially her doctor thought that would be fine, but when Lynzi eliminated a large amount of fluid, he reevaluated. The hospital requested an air ambulance. REACH 6 in Lakeport responded. As if a medical emergency wasn’t enough, to add insult to illness Lynzi was going to miss that day’s Warrior’s playoff game. This was an enormous disappointment, so Craig helped ease that particular pain. Oracle Arena, home of the Golden State Warriors, was in their flight path. Emily shares, “When we were over Oracle, he tilted the helicopter so Lynzi could see it, and Cindy took a picture. Cindy later had the picture enlarged, and she sent the enlargement to Lynzi.” Emily says that whenever her daughter stays in the hospital, she takes the picture with her and hangs it in her room. Emily admired how the crew worked with her daughter during the flight. “They were wonderful. She’s at that age where she wants to be really private with her body, and here she is in a pretty small space with two men next to her and a woman she doesn’t know behind her. But the way they shielded her made her feel completely comfortable. They were so respectful.” Cindy confirms that “having a plan that would give Lynzi some dignity” was very important to the crew. Lynzi is happy to be on the road to recovery. “We’re so lucky to have REACH in our area,” Emily emphasizes. “It’s such a good service. If what happened to Lynzi between the time we landed and the time we got to ICU had happened in the back of an ambulance, I don’t know what we would have done.” Although Lynzi will always have diabetes and the associated water balance risks, she is able to take a replacement hormone that helps her body with the regulating. And as Emily pointed out earlier, they’ll never say no to a helicopter. REACH wishes Lynzi and her family a happy, healthy future together. We are truly honored to have played a part in Lynzi’s healing.